This unique East Side Collection Ultimate Traveler Pet Carrier is exclusive to Pet Edge in the United States! Durable and compact carrier boasts a front pocket that unzips to create a mesh covered resting area for pets. Breathable and lightweight construction includes a side door for additional access. Contains several pouches and zippered pockets for storage. Includes seat belt attachments, a collar clip and a comfortable Berber mat. 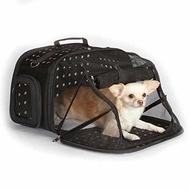 Each East Side Collection Ultimate Traveler Pet Carrier includes a hangtag for easy retail display. See the Specifications and Instructions tabs for product details.